The fictitious town of Cabot Cove, is actually Mendocino. 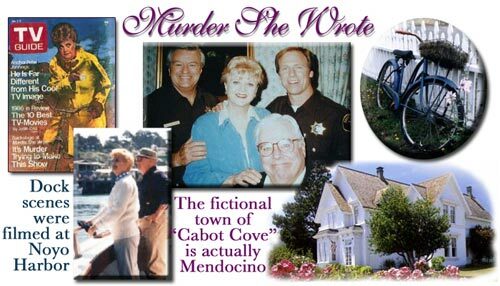 The popular television series, Murder She Wrote, starring Angela Lansbury was filmed in Mendocino, California. Big fans of the series will recognize the homes exteriors that are frequently seen throughout Mendocino Village. A Victorian bed and breakfast in Mendocino ( On the corner of Ford and Little Lake St) was featured as Jessica Fletcher's home in the fictional town of Cabot Cove, Maine. All of the dock scenes were filmed in Noyo Harbor as shown above. Also shown is Jessica Fletcher's House, her bike seen in the opening shots and a photo of the cast. The cast and crew of this series were friendly and casual. It was common to see Angela Lansbury stoop to speak with a toddler, or for Tom Bosley to sign his autograph on a Glad Bag box, proudly presented by a shopper, stepping out of the local grocery store. While many movies have been filmed in and around the picturesque town of Mendocino, few have left behind such lasting feelings of endearments. Universal Studios broadcasted 264 episodes of Murder She Wrote between September, 1984 and May, 1996. Local residents looked forward to the filming, as over a hundred and fifty were chosen to play background parts. A lucky few were cast for speaking roles.